The Lady Bulldog softball team completed a clean season sweep of Goddard Tuesday in Roswell and, most importantly, evened their District 4-AAAAA record at 5-5 with two five-inning, run-rule wins over the Lady Rockets, 15-0 and 18-2. The girls in orange jumped on Goddard early in Game One, taking four runs out of the top of the first on a pair on a costly trio of Rocket errors. Three more unearned runs came around in the second on an Adrianna Baeza single, an error, and a Gabrielle Gomez RBI base hit to left. With starting pitcher Kacey Thurman and her defense continuing to hold Goddard scoreless, Artesia achieved the run-rule margin in the fourth on a two-RBI double by Aubree Olguin and a Gomez single up the middle, then tacked on five more for good measure in the fifth on a Baeza two-RBI double and back-to-back home runs by Cassandra Trujillo and Gomez, the former for two runs. Thurman gave up just a pair of hits through five innings, striking out four and walking two. Baeza led the team at the plate (3-3 with a double and three RBI), Gomez was 3-4 with a home run and three RBI, and Trujillo went 2-3 with a homer and two runs batted in. Game Two saw the Lady ‘Dogs again log four runs in their inaugural at-bat on a Gomez sac-fly, an Ale Flores two-RBI double, and an Elisa Cardenas base hit. Goddard got on the board for the first time on the day in the home half on a single-turned-error and a RBI ground out, but the Artesia girls went directly back to work in the top of the second. Two more runs crossed on a Melody Payne solo homer – her second of the season – and a Trujillo sac-fly, and the Lady ‘Dogs made it 9-2 in the third on an error and a two-RBI double by Baeza. Back-to-back RBI singles in the fourth by Cardenas and Madisyn Asbury gave Artesia an 11-2 advantage, and the Lady Bulldogs batted around to tack on seven in the top of five on RBI doubles by Gomez, Flores and Payne, a RBI triple by Cardenas, and a Stacia Martinez single. Junior Shyann Spence logged the W in the circle for Artesia with three hits and one earned run allowed through four complete. McKayla Liles, on in relief in the bottom of the fifth, had zeroes across the board. Offensively, Alexa Riggs and Cardenas went 3-4, the latter with a triple and three RBI, Gomez was 2-3 with a double and two RBI, and Flores and Payne were 2-4 with five RBI between them. The Lady ‘Dogs (13-11) will be looking to close out their district slate on a high note Friday in a 5 and 7 p.m. double dip against Lovington at the Mack Chase Athletic Complex. 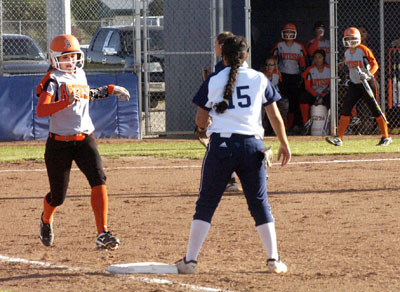 Artesia split with the Lady Wildcats April 19 on the road. Seeding and selection for the Class 5A State Softball Tournament will be held Sunday.